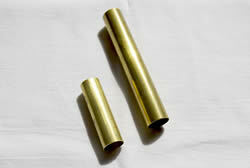 Spare frame pieces and alu / brass fittings for old / new Klepper, Wayland, Poucher and Tyne boats, and more. If not listed here, do ask us and we will try source for you. It is possible that we may be able get enough spares to rebuild completely, a particular old model folding kayak if you wanted too. Some common complete frames are already available (look under 'Rebuilds'). There are too many parts to be listed here - contact us with your requirements. We do both the original 'used, in good condition' spare parts for the 'vintage' kayaks as well as new parts for later / current models. If you require replacement skins, look under 'Replacement skins'. Accessories for these old kayaks such as kayak carry bags, spray covers can be found under the respective pages. Spare parts - new - Most spare replacement fittings are available. 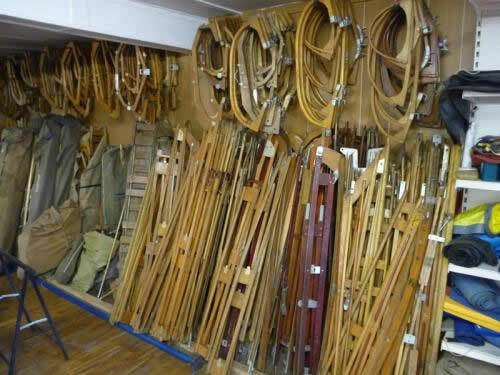 Original British Tyne frame parts available at good prices (we need to clear out!). Not all spares are listed here - do enquire. 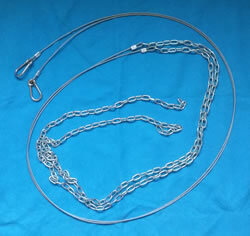 Steering lines comprising of eye carabineer, steel cable (230cm) and welded link chain (100cm). Locally custom made to order. (Photo coming soon) Steering lines comprising of eye carabineer, steel cable (230cm) and para cord (100cm). Not suitable for rear boomerang coaming piece fitted with a spring clip (earlier model Klepper AEII). Suitable for boomerang version shown below. Black rubber seats for Klepper / Wayland cross ribs. 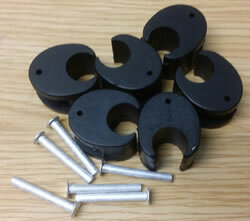 Fits cross rib thickness 12mm and pole stringer diameter 15mm. Complete with rivet and washer (or screws - for old Wayland models). Made of normal rubber. Blue rubber seats for Klepper / Wayland cross ribs. Fits cross rib thickness 12mm and pole stringer diameter 15mm. Complete with rivet and washer. Made of specially treated rubber.